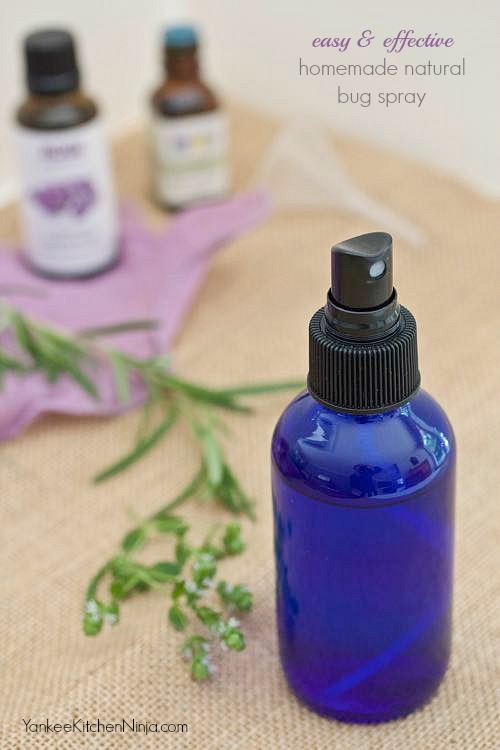 Make your own homemade natural bug spray with only 3 ingredients: an easy, safe, effective and great-smelling way to repel insects this summer. 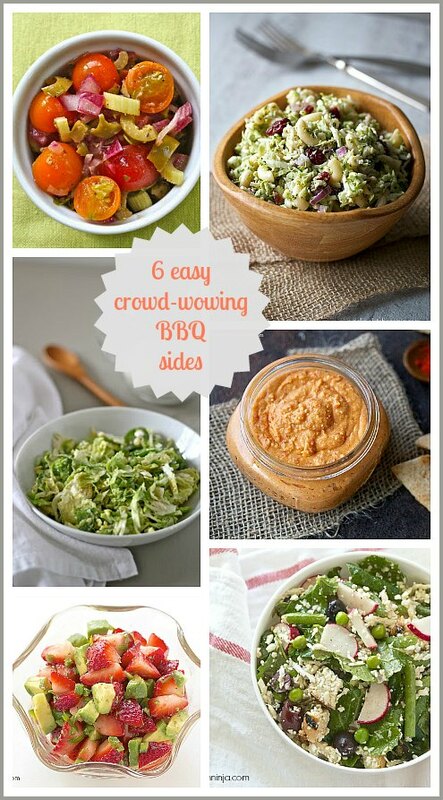 I'm giving you a different kind of recipe this week. And here's why. Our latest house doesn't have a screened porch. While it does sport a large, expansive deck with lovely wooded views, it doesn't offer the iron-clad protection from flying insects that a screened porch does. And since I didn't want to spend the summer dousing myself or Mr. Ninj in chemical-laden commercial insect repellent just to be able to enjoy morning coffee or evening cocktails on the aforementioned deck, I whipped up some homemade natural bug spray. OMG, friends, I love this stuff! Why? 1) It's all-natural, made with lavender and lemon eucalyptus essential oils that have naturally occurring insect-repelling qualities -- yay for nature! 2) It not only smells lovely, it's also cooling and refreshing -- yay for smelling good! 3) It's wicked easy to make, just three ingredients -- yay for laziness! 4) It's a wonderful way for me to incorporate gorgeous cobalt blue bottles into my daily life -- yay for pretty, colorful things! 5) IT ACTUALLY WORKS -- yay for NO BUGS! 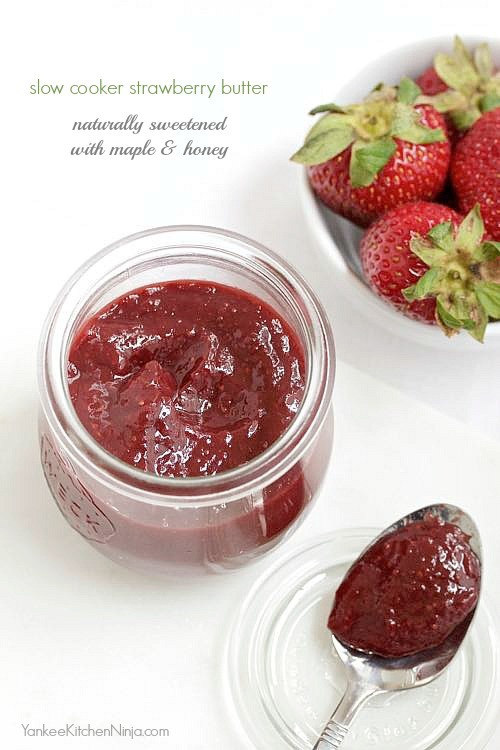 Slow cooker strawberry butter is sweetened naturally with pure maple syrup and a touch of honey -- enjoy it on toast or stirred into yogurt or oatmeal. I scored the very last of the local strawberries from a neighborhood farm market this week. Which threw me into such a panic (No more strawberries until next year? Gaaaaaaah!) that I had to preserve them. I froze a bunch for smoothies and then thought about strawberry jam. But then I tried to think of something else with less than a bazillion pounds of sugar. And that reminded me to check Marisa McClellan's latest preserving book entitled Naturally Sweet Food in Jars. This is a whole book of preserves made without refined sugar. Yes! No white sugar -- amazing, flavorful jams and preserves sweetened only natural sweeteners like honey, maple and fruit juices. I do so love to can but sometimes the amount of sugar required to keep our favorite jams safe for canning makes me feel like I'm defeating the purpose of putting up healthy fresh fruit. After making a couple of batches, I've decided this strawberry butter is my new favorite thing. It's like apple butter ... only so much freakin' better. I've been spreading it on toast, natch, but we also love to stir it into plain yogurt for breakfast. And I haven't even begun to start baking or making overnight oatmeal with it yet! 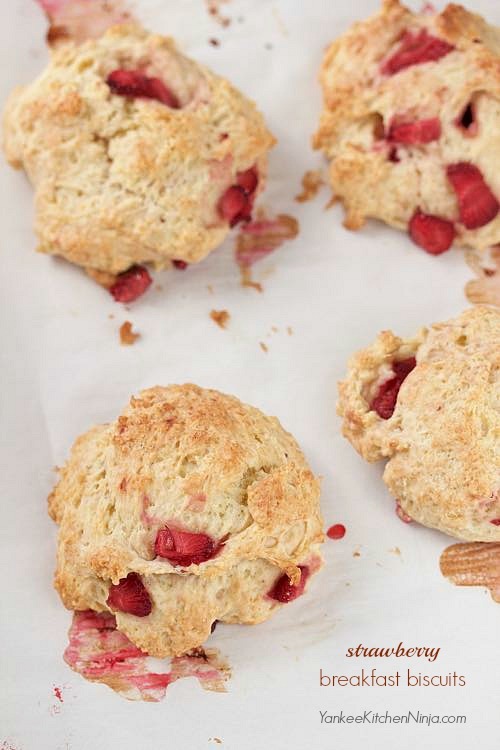 Strawberry breakfast biscuits: not too sweet, with a scone-like texture, and super easy to make. Try them in strawberry shortcake, too. Lest you think it's all savory crockpot dinners around Casa de Ninj all the time, I'd like to introduce you to my new favorite baked good: strawberry breakfast biscuits. Regular readers and makers of my recipes will not be surprised to hear that these are a not-so-sweet biscuit -- not nearly as sweet as a pastry or muffin, with a slightly scone-like texture. They really let the flavor of fresh, seasonal strawberries shine. And, of course, they are super easy to make, because that's how I roll -- no mixer, no rolling, no lightly-floured work surface, no biscuit cutters. 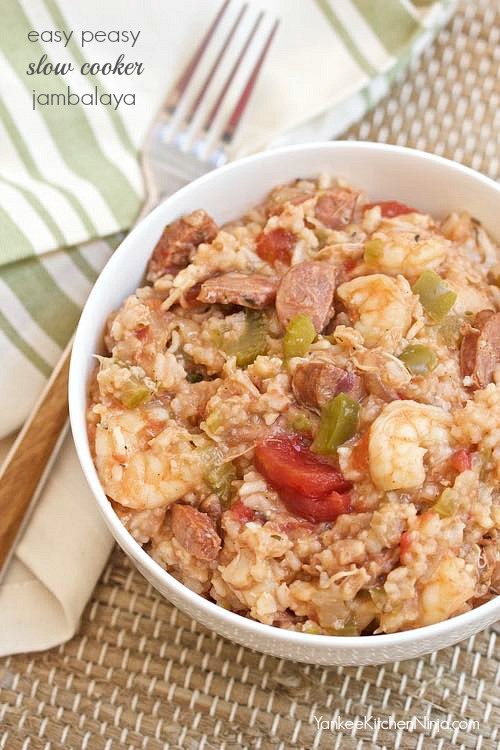 Enjoy this easy jambalaya, delivering all the spicy Creole flavor you love but made effortlessly in your slow cooker. But the food. Oh my gosh, the food. It's the only place I've ever lived where I gained more than 10 pounds really, really quickly. Because the food. Oh my gosh, the food. In fact, I had never even eaten jambalaya until I lived in New Orleans. And I certainly had no idea the awesomeness that I was missing! Jambalaya is now one of my all-time favorite comfort foods -- and not just because of the smoked sausage. Yet, as with long-cooking rice dishes like risotto, I never really made jambalaya a lot at home because it was too time-consuming. Not so anymore, thanks to the slow cooker.